Suntory… today the name virtually defines the beverage business in Japan. Founded in 1899 to import and distribute wine, they quickly branched out into their own products in 1907. In 1923, they stepped out again, this time into the nearly sacrilegious effort of distilling a single-malt Whisky in Japan. But the dogmatic traditionalist of the spirit-loving West soon forgave Suntory’s heresy for the most pragmatic of reasons … they made great Whisky and pioneered the delicate and problematic use of Mizunara Oak in the process. In the 90 years since then, Suntory has expanded through home grown brands and the acquisition of established business around the world. Perhaps most notable of which was their acquisition to American distiller Beam, Inc. in 2014, bringing their world-wide sales to more than $10 billion per year. Not too shabby. Their various holdings produce dozens of whiskies, beers, liqueurs, and soft drinks that span the globe. A beautiful Japanese girl approaches you, her black Kimono shining in the lamp light. She is carrying a tray with crystal stemware and a bottle of Hibiki Japanese Harmony upon it. As she arrives at your table, she gently bows, brushes a red, silk cloth across the rim of your glass, and then pours the spirit slowly… allowing the sweet perfume of the spirit time to rise. Then she presents it to you with both hands. The sights, sounds, aroma and taste become a ceremony worthy of the craftsmanship. Each of the senses is satisfied and they are meaningful, purposeful, gentle and… in harmony with each other. Hibiki means harmony. And that is exactly what this whisky is… a harmony of at least five premium whisky styles of various ages and aging methods. And while four of those are single malts, the fifth is a grain from the Chita peninsula in central Japan. Some lesser producers use these techniques to hide inferior spirits in the mix, Suntory Hibiki Japanese Harmony is doing just the opposite. This is a top-flight attempt to find a new taste, a new experience. And you cannot fool the Whisky community, who have made Hibiki one of the most honored Whiskies in the world, bar none. “For relaxing times, make it a Suntory time,” Bill Murray said a few times in the movie “Lost in Translation”. He was actually drinking the Suntory Hibiki. Oh and yes, Sean Connery also drank Suntory (Old) in the James Bond movie You Only Live Twice. What does Suntory Hibiki Harmony taste like? The Flavor Spiral™ shows the most common flavors that you'll taste in Suntory Hibiki Harmony and gives you a chance to have a taste of it before actually tasting it. Floral Hibiscus, honey and wood. Custard, honey with strong notes autumn fruits. Excellent, smooth, easy to drink. A go to favorite now. This truly is a blend that embodies a lifetime of passionate pursuit of excellence. Such a wild array of absolutely amazing flavor. Truly a journey of exquisite delight. One not to be shared. One that deserves sacred obsession and hoarding. Incredibly smooth sipping whiskey. Possibly my favourite one. I used to think that blends aren't as flavorful as pure single malt. And then I had Johnnie Walker Platinum and that piqued my interest. And then I had the Johnnie Walker Blue and I was amazed. And then I had this Hibiki Harmony and the floor was swept from under me. Holy concoction of life giving elixir, batman! I would give this a 9.5 on the WOW scale if I could. I have yet to taste anything that would qualify as a perfect 10, and for comparison, the Macallan Rare Cask Batch #1 2018 is top-notch at 9.8 for me. 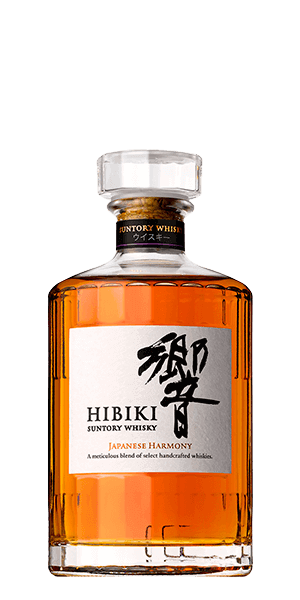 This Hibiki is a must-try for anyone who believes that Blended Whiskey cannot match the flavor & impact of Single Malt. Everything about it screams for 2nd, and 3rd, and 4th. I just wish there were more of it available. Are you listening, Suntory? If you reside here in the pacific NW...you can also get a bottle of the santory at Uwajimaya market in Renton..."kompai!!!" Very malty finish, detected almost a marzipan aftertaste. Smooth. Definitely my favorite japanese whisky. I always have a bottle in my cabinet. So far my favourite whisky in the world. Juicy, fruity, oily with no alcoholic taste or nose whatsoever, an amazing blend! My wife and I both love this Japanese whiskey, it is smooth and very easy to drink, I can't wait for it to return to stock!! A smooth finish that delivers a complex amount of flavor. Prefer with just a small amount of ice to really bring out all of the different flavors that this drink has to deliver. Wow. This is a surprising smooth and great tasting whiskey. The best Japanese whiskey I’ve tasted so far. very smooth a slik taste wit h little burning....hard to describe but think you will like it after tasting..
Nice sweet smell and a smooth well balanced taste. Great to sip on! I like it neat to taste all history of Japanese whiskey. The grain flavors are profound and subtle at the same time. Still hard to get but not as hard as getting the aged varieties. It's hard to remind myself that I need to make it last. I love it neat and will have water with ice on the side if I don't want the buzz to hit too fast. Delivers what it claims to. No after burn. Exquisite aftertaste. Very surprise how smooth, little burn going down. Taste was so good. Very light in taste but delivers all it flavors. An all time favorite. Great blend of flavored and smooth all the way through without being boring. Mild peat, gentle flavors. Good on ice. Smooth, fruity and pleasant taste and note. Fresh aftertaste with a hint on spicyness. This is delicious. Slightly Smokey, great taste. Smooth. Smooth. Hint of chocolate. Like a warming hot cocoa with a whiskey finish. Love it ! May suffer from over blended syndrome. But still a very smooth dram. Easy sipping. Great flavor. Though, I believe it was a slightly different taste than what I have received in Japan. Perhaps a simply a different year/blend? One of the best Japanese whiskeys I've tried. Smooth overall and flavorful throughout the finish. Reminded me of drinking egg nog at Christmas. I don’t think it lives up to its reputation but it is an extremely pleasant dram. Hibiki is full of character and much more complex than a typical bourbon or one-note scotch. Harmony is a very accurate descriptor because all of your favorite parts of a scotch are married here to the best characteristics of a more mellow Kentucky-style dram. Smoke but just enough, dry but satisfying, and above all Balanced with each flavor practically singing a campfire kumbaya with one another on the palate. This is a perfect expression to match the name, and a great scotch to enjoy neat, chilled, or with a single rock or ice ball. A beautiful bottle with a great taste. Very smooth and well balanced. Can’t ever go wrong with this drink. Nose has bright, sweet floral tones (honeysuckle, vanilla) with a deeper sandalwood/cedar-like spice note beneath. Flavors bloom softly in the mouth with vanilla and light caramel up front, before progressing into citrus zest, light fruit, spices (nutmeg, white pepper,) and oak going into a dry finish with hints of cocoa powder and light smoke. Mouth feel is smooth and easy without being insubstantial, and alcohol is gently warming. The label talks about harmony and you can take Suntory at their word- the balance of sweet/spicy/smokey/bitter here make this just a great all-around whisky. I love this whisky. So easy to drink, nice floral notes and the taste of apples or some other fruit. Easily the best whisky I’ve had so far. Lovely. Your typical extremely balanced, nuanced, and delicate Japanese whisky with a good about of body and more punch them some of the lighter stuff. A very enjoyable whisky. Best one from Japan that I have tasted thus far. Very drinkable on its own and leaves you wanting some more. Tried it for the first time 2 months ago and fell in love with this whisky. Fruity on the nose and well balanced between smoky, spicy, and fruity on the palate. Great presentation that’ll look good on any shelf. Great Japanese blended whiskey. Very, very clean and very smooth. Probably easiest whiskey to drink around. Go to Whiskey when in doubt, and great value for the money. Really enjoyed the fruit and chocolate notes in this one. My favorite of the Japanese whiskey taster. Started with Toki, and this is a perfect yin to the yang! Great sipper! Reminds me of a Japanese Jameson. More complex but similar to an Irish whisky. Delicious notes of honey and citrus with smokey undertones. Enjoy neat or on the rocks. This is my favorite japanese whisky. it's very similar to an irish whiskey, due to it's sweeter, friendlier flavor. Plays very well neat, or on the rocks. Haven't tried in a mix drink, and using it like that would feel like a waste of such a delicious drink. Definitely buying this since it just came back into stock. Harmony is the right word. On the nose, the honey and mild smoke combine for a very pleasant barbecue note. Smooth mixed fruit and pepper in the mouth and sweet lingering chocolate on the finish. Wonderful! Hibiki is my favorite or the Japanese Whisky’s, very smooth after just 10 minutes on a large single cube. Yum, that will promote “harmony” in uour life! Good smoke, no burn, great flavor. I really enjoy this one. Has a nice smooth fruity taste. This is Defiantly one to keep in rotation! Reminds me of Tory, nice and smooth at first, then no afterburn, then the caramel sets in, success! I'm new to the Japanese whiskey but so far they are sooo clean to sip! One of the best of your selections - mildly sweet - fruity - i will continue to purchase this and give it as gifts to my best Buds . . . I Highly Recommend it ! ! This is my first Japanese whiskey and I’m impressed. This is really good. It’s all the right flavors for me, but could be just a bit smoother. Memorable from the first sip. Great balance, finish, and taste. Definitely recommend. Love this whisky. Very smooth and balanced. Excellent flavor and finish. Little thicker than im used to, but tastes great. Very smooth with a nice hint of honey. Great way to end the night. Really well balanced. Sweet with oak overtones. Great purchase. One of my favorite Japanese Whisky's. Very smooth. Was presently surprised! Really love the flavor of this. Easiest drinking whisky I have found. Sweet and smooth. Not like the 12 or 17 but it’s still good. Thoroughly enjoyed this. One of my go to drinks. Light peat, floral nose, and mild....this is a wonderful finish to a mild meal and perfect enough to carry you through into spring. Definitely enjoy this whisky. Smooth, flavorful and I think just the right amount of notes to keep it interesting. Not a overpowering whisky but a nice sipper. Solid, strong flavors from the start to finish. A lovely flavoured Whisky slightly sweet but delightful. Not a bad whisky. Strong notes of butterscotch and honey. Definitely get the orange zest also. Goes down easy but much too sweet for my taste. The Suntory whisky is incredibly smooth. Be careful. Loved it. Very smooth, with a good taste. Great taste and all of the flavor spiral is represented. This stuff is great. Buttery and smooth. It's one that I say I'll just have one or two glasses and move on to another then next thing I know the bottle is halfway down the bottle. One of my favorites. Sweet and fruit after tastes. Very smooth going down. Love it. Excellent whisky. I love the subtle sweet beginning and has a very smooth finish. This is my first Japanese whisky and I would highly recommend. Beautiful flavors that balance well with a clean finish. Harmony does well in describing this whiskey and representing Japan. A bit sweet, not spicy. Finishes well. Very Whisky, light in color finishes well. The Japanese really nailed this one. Great flavor not overpowering. Hibiki is a great whiskey. I am not a tasting notes kind of guy. Either I like it or I do not. This whiskey is very smooth and great tasting. I bought it along with the Nikka Coffey Grain Whiskey and both were great but the Nikka was slightly better tasting and equally as smooth for my tastes. Recommend both but if you have to choose one I recommend the Nikka. I always have Hibiki in my cabinet. It's complex and balance, and has the perfect amount of smoke and vanilla. I've not found it to be fruity though, even though I often see it mentioned. I really like the way the flavors seem to change on the palate as you sip it. Very mellow whiskey... on the sweet side, but that's not a bad thing. I thoroughly enjoyed this sample. Heavy vanilla and caramel nose. Slightly oily mouthfeel. Great choice if you don't want to break the bank. One of my favorite whiskeys, has a lot of flavor and smells absolutely divine. It is very smooth, and I highly recommend it. Excellent taste for the price point. Slightly sweet with a spicy finish. Nice flavor with a little burn. Wonderfully smooth, slightly sweet, and complex. I usually go for scotches, but this whiskey is a wonderful addition to any home bar. One of my favorites to date. Very smooth flavor. I've been tasting a lot of Nikka and Hibiki, all good whisky. I'll be buying another bottle of this one. Burns the tongue at first taste. Nice, honey flavour once the burn dies down. Not my favourite, but tasty. Great flavor!! Really smooth. My favorite! A friend of our said that we had to try it and if we did, we would love it, he was right! Great! One of my favorites, it's light, smooth, and carries a great balance of spice and malt notes. Enjoyed this whiskey very much, very smooth, with a lot of vanilla and chocolate notes. Not impressive for the price point. The is a very good Whiskey, sweet vanilla, chocolate notes with a smooth finish. Definitely one too keep in your bar! Pretty smooth, but doesn't seem to live up to the price. Flavor is great. Would definitely re-buy. Not as smooth as advertised but worth it for the finish. It's been over 20 years since I've sipped any Suntory in the United States. This new bottle of Hibiki is best (IMHO) with a splash of water to mellow out while sipping. One of the most complex whiskies on the market. very nice from scent to swallow.beautiful finish with a light flavor. a must have for any serious whiskey drinker. For my first step into Japanese Whisky...What a treat! The aroma was a pleasure and the sip fills the mouth with subtle flavors which show this to be a top notch addition to any collection. I was greatly impressed and will be adding more Japanese whiskies to my home bar. Very Smooth. Will absolutely order again. So good, you'll forget it's a blend. Sweet, complex, smooth. What a blend should be: a mix of whiskies to produce an intended flavor. You listening JW? Great first Japanese whisky for a novice but it will easily be overshadowed and outshined by its 12 yo big brother. Possibly the best whiskey I have ever tasted. Very smooth and satisfying taste. Great for after a hard day at work. I totally recommend giving this one a try. The most balanced whiskey I've ever had. Excellent harmony. Best Japanese whiskey I have tried. Comparable to blantons. It's difficult to put words to the exact flavours I could pull out of this whisky but I can speak to the feelings that it causes in me. 'Harmony' is probably the best word to describe the experience that is this whisky; very balanced, yet complex collection of flavours throughout the dram that stir up a feeling of "just getting home after a long day" with every sip. Warning: reaching the end of the bottle is an especially sad moment. Longest finish I've ever had on a non-age-statement whisky. Caramel, vanilla, dried fruits, it's initial palate is certainly light and youthful, but the finish is so deep and warming. My first venture into Japanese spirits, and definitely not to be the last. Good aroma, good flavor, has some bite though, little pricey for what you get. Look like something I would become addicted to, however, fixed income prohibits me. Ok flavor. A little harsh. Less complex than others I've tried. Great for anyone who doesent like smoky flavors. Its soft, tastes great, i can only recommend it. Beautifully butter and sweet on the palette when taken with a little water.